What a wonderful life, you have everything you need and want. Hi Chip in Croatia! Happy Pet of the Day to you, and to your brother and trusty sidekick, Moe, too! What a beautiful Degu you are, Chip! Those big, brown eyes of yours are total heart-melters! No wonder your mommy nicknamed you Romeo, hehe! You may have a bit of a naughty streak, which to my mind just adds to your charm! But one look into those warm, pleading eyes and no doubt all is forgiven in a nano second! What a happy, carefree life you and Moe have been blessed with, including but not limited to deluxe accommodations, tons of fun "free" time, and best of all, a devoted human! Speaking of humans, how lucky your mom is, having a joyful, life loving, personality packed best furry friend in you, and in Moe! Double the fun and love! Thanks for the smiles, sweetheart! Meeting you today has been a real treat! And thanks for taking the time to inspect that pretty flower, allowing your mom to snap a photo of you! Now the entire world can see just how beautiful you are! Hope you're enjoying a very special day of celebration...playing with Moe and helping your mom as she works at her desk, searching for those coveted treats, hehe; receiving countless cuddles; being loved and pampered to pieces! Lots of love, cuddles and kisses to you, precious Chip, our very special and most deserving Pet of the Day, EVERY day! Love to dear brother Moe, too! Chip is just adorable all the way 'round! It's nice to know that chip and Moe lead such an affluent life, all the best stuff and loved to bits. Life is good eh Chip! Dearest Chip, you are adorable! What an utterly precious Degu you are! You are so pretty, gazing out at me with those lovely big eyes in that sweet face. It's easy to see you're looking forward to nibbling on that flower! I don't think I've ever met a Degu before, and what a pleasure it is to meet you and learn a little about Chilean squirrels. You are your dear person's own little Romeo, and you even have your brother Moe there to double the fun! You and Moe and your dear person all love each other very much, don't you. What a wonderful love-filled home you share! 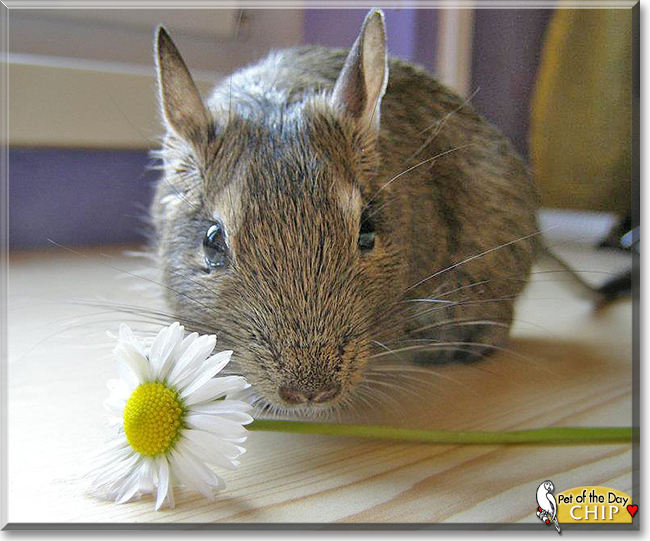 Congratulations, darling Chip, on being chosen today's Pet of the Day! We hope you and your dear person and dear Moe and all your family and friends are enjoying a fine celebration, full of fun and lovies and all your favorite games and treats, maybe even another flower to munch on? !